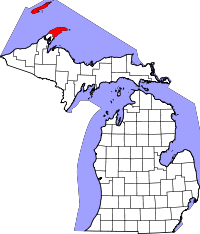 Keweenaw County, the most northern county in Michigan and also the least populated with only 2,100 residents, has a small vital records research area with the Keweenaw County Clerk that is open to the public on weekdays from 9:00AM until 4:00PM. Two researchers are permitted at once in the office which is located on HC 1 in Eagle River, MI. Marriage and death records are listed from 1869, only a few years after the county was founded, to the present. Birth records are available from the same time period, but only records older than 110 years are open to the public. Individuals interested in researching divorce records, which are available from 1959 to the present, are directed to contact the Michigan Technological University in the town of Houghton. Keweenaw County is home to several national parks, including the Isle Royale, a chain of 450 islands in Lake Superior that comprise the Isle Royale National Park.